The latest edition of Nation Geographic is reporting that redheads (known as "gingers" in the UK and Australia) may be extinct in 100 years. Red hair is extremely rare--less than 2% of the world's population possesses it. And it takes two parents with the redhead gene to produce a ginger child. With more and more people marrying outside their own communities, it's becoming increasingly unlikely that two people with this uncommon gene will come into contact. The gene itself is a mutation that arose in Northern Europe thousands of years ago, and the Vikings were largely responsible for spreading it throughout Europe. Today, Scotland may be the last hope for the redheads of the world. Almost 40% of the Scots carry the gene. Aww... that's suckes. I always wanted to have red hair. SEROUSLY? RED WILL BE EXTINKTED? MY FRIEND IS GOING TO FLIP WHEN I TELL HER. O. my. gosh. That stinks! Red hair is awesome! I can't believe it. 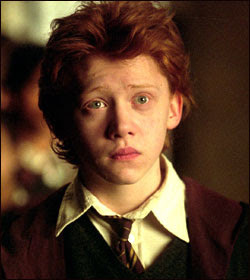 Ron, i'm terribly sorry. But i'll always love u, even if your hair falls out! I know a bunch of people with red hair! If there are so little red heads then why do I know so many of them? Darn it guys, red hair isn't going to fall out. It's just a recessive gene, which means that in a long time, people will all have dark hair and dark eyes, since that isn't recessive. It doesn't mean that people who are already redheads are gonna be bald or anything. Jeez!